Custom domains or vanity URLs can be used with HelpJet to replace the yourdomain.helpjetapp.com URL. This can be used to map a root domain (eg. example.com) or a subdomain (eg. support.example.com) to your HelpJet site. To use a custom domain, select the Custom Domain menu from your Help Center Management Screen. Note: You must already have registered and own the domain, HelpJet does not register or allow you to register or manage the domain ownership. Enter the URL of the domain you wish to use with your Help Center. Your custom domain request will then be sent to the HelpJet support staff, who will verify the domain. You need to ensure you have updated the DNS records for your domain before your custom domain can be verified. Domain name registrars vary in the way DNS records can be managed, for assistance with updating DNS settings, please contact your domain registrar. 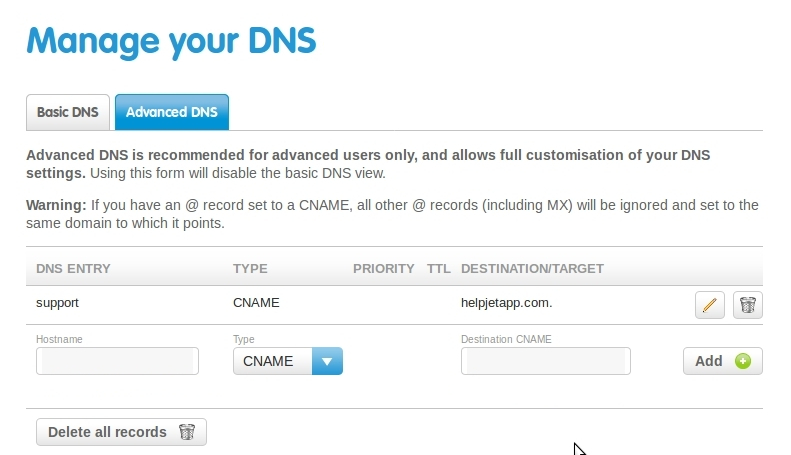 This example assumes you are using a root domain, such as example.com for your HelpJet custom domain. This example assumes you are using a subdomain, such as support.example.com for your HelpJet custom domain. Create a new CNAME record for the subdomain that points to helpjetapp.com. The DNS entry should match the subdomain slug, so if you want to use support.example.com, the DNS entry should be slug. If your wanting help.example.com, it should be help.